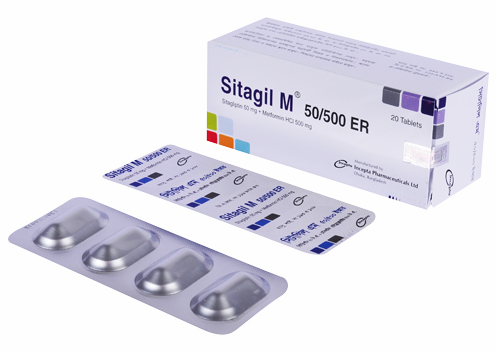 Sitagil M 50/500 ER: Each extended release tablet contains Sitagliptin Phosphate Monohydrate INN 64.25 mg eq. 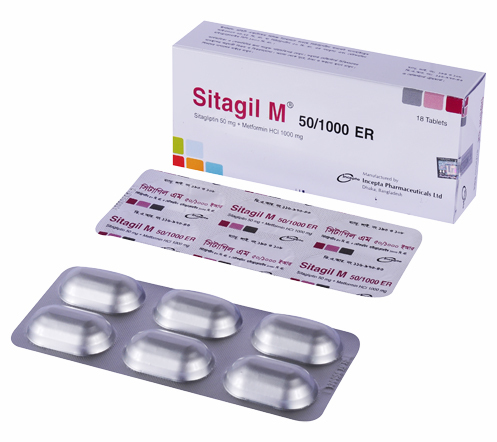 to Sitagliptin 50mg & Metformin HCl BP 500 mg.
Sitagil M 50/1000 ER: Each extended release tablet contains Sitagliptin Phosphate Monohydrate INN 64.25 mg eq. to Sitagliptin 50 mg & Metformin HCl BP 1000 mg.
Sitagliptin is a dipeptidyl peptidase-4 (DPP-4) inhibitor, which exerts its action by slowing the inactivation of incretin hormones. Incretin hormones, including glucagon-like peptide-1(GLP-1) and glucose-dependent insulinotropic polypeptide (GIP), are released by the intestine throughout the day and levels are increased in response to a meal. These hormones are rapidly inactivated by the enzyme, DPP-4. The incretins are part of an endogenous system involved in the physiologic regulation of glucose homeostasis. When blood glucose concentrations are normal or elevated, GLP-1 and GIP increase insulin synthesis and release from pancreatic beta cells by intracellular signaling pathways involving cyclic AMP. GLP-1 also lowers glucagon secretion from pancreatic alpha cells, leading to reduced hepatic glucose production. The pharmacologic mechanism of action of Metformin is different from other classes of oral antihyperglycemic agents. Metformin decreases hepatic glucose production, decreases intestinal absorption of glucose, and increases peripheral glucose uptake and utilization. Sitagliptin + Metformin ER is a dipeptidyl peptidase-4 (DPP-4) inhibitor and biguanide combination product indicated as an adjunct to diet and exercise to improve glycemic control in adults with type 2 diabetes mellitus when treatment with both Sitagliptin and Metformin extended release is appropriate. May adjust the dosing based on effectiveness and tolerability while not exceeding the maximum recommended daily dose of 100 mg Sitagliptin and 2000 mg Metformin extended release. Administer once daily with a meal preferably in the evening. Gradually escalate the dose to reduce the gastrointestinal side effects due to Metformin. Maintain the same total daily dose of Sitagliptin and Metformin when changing between Sitagliptin + Metformin ER, without exceeding the maximum recommended daily dose of 2000 mg Metformin extended release. Swallow whole. Never split, crush or chew. • The most common adverse reactions reported in ≥5% of patients simultaneously started on Sitagliptin and Metformin and more commonly than in patients treated with placebo were diarrhea, upper respiratory tract infection, and headache. • Adverse reactions reported in ≥5% of patients treated with Sitagliptin in combination with Sulfonylurea and Metformin and more commonly than in patients treated with placebo in combination with Sulfonylurea and Metformin were hypoglycemia and headache. • Hypoglycemia was the only adverse reaction reported in ≥5% of patients treated with Sitagliptin in combination with insulin and Metformin and more commonly than in patients treated with placebo in combination with insulin and Metformin. Do not use the combination of Sitagliptin & Metformin in patients with hepatic disease. Before initiating the combination and at least annually thereafter, assess renal function and verify as normal. May need to discontinue the combination and temporarily use insulin during periods of stress and decreased intake of fluids and food as may occur with fever, trauma, infection or surgery. • There are no adequate and well-controlled studies in pregnant women with Sitagliptin + Metformin ER or its individual components; therefore, the safety of Sitagliptin + Metformin ER in pregnant women is not known. Sitagliptin + Metformin ER should be used during pregnancy only if clearly needed. • It is not known whether Sitagliptin or Metformin are excreted in human milk. Because many drugs are excreted in human milk, caution should be exercised when Sitagliptin + Metformin ER is administered to a nursing woman.